This is an add-on post to the last one featuring a bunch of old plastic capsule toy charms. 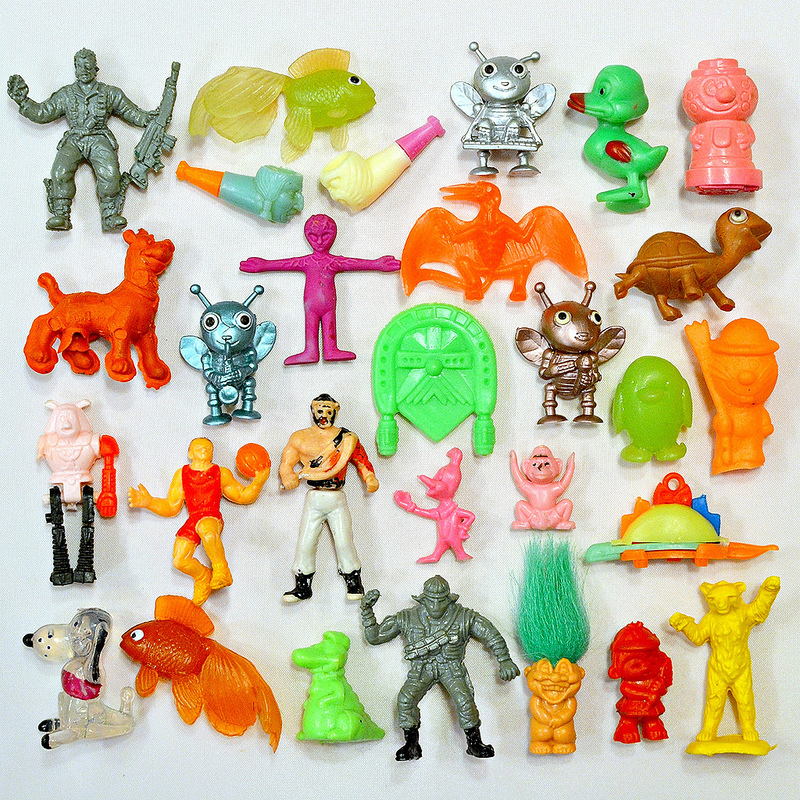 Here's an even more random group of cheap vending toys I gathered together recently. There's no rhyme or reason to the mix - it just made for a fun photo. I believe the figures here range from the 1980s to the 2000s. I remember spending a lot of effort and quarters to get that crappy Scooby Doo pencil topper sometime in the '90s! The pink gumball machine stamper in the upper right I've had for as long as I can remember, and might not even be from a capsule machine. Has anyone ever seen one of those? The goldfish are actually pretty nice. I had that spaceship in the middle in a different color and the pink/red/black robot missing an arm, but mine is green. Nice stuff. You don't seem to find these types of toys to often anymore. OH MAN I loved those googly eyed animals like the turtle on the right. I had a handful of them! My favourite capsule toy as a kid was a green robot dimetrodon, based on Zoids (not sure if bootleg or legit). Eric Nilla sold a red version a few years ago, but I missed out (http://ericnilla.storenvy.com/collections/95908-all-products/products/1898117-zoids-keshi-dimetrodon). Would love to get hold of another one sometime. That's great! I love those Zoids keshi. I got a few bootlegs out of capsule machines as kids, but not that particular one.